Rating: 0 of 0 votes Topic: Latest Science News? What science news item have you found today to be of interest? In a recent paper published in the European Journal of Physics, Marin has written a short history, based on a longer analysis, of the mysticism controversy in the early quantum physics community. As Marin emphasizes, the controversy began in Germany in the 1920s among physicists in reaction to the new theory of quantum mechanics, but was much different than debates on similar issues today. At the turn of the last century, science and religion were not divided as they are today, and some scientists of the time were particularly inspired by Eastern mysticism. In his analysis, Marin lays out each player’s role and perspective in the controversy, and argues that studying the original interpretations of quantum mechanics can help scientists better understand the theory, and could also be important for the public in general. The controversy boils down to the age-old question of the nature of reality. As Einstein (a firm realist) once asked, does the moon exist only when looked at? Although such a viewpoint seems unlikely in our everyday lives, in quantum mechanics, physicists’ observations can sometimes affect what they’re observing on a quantum scale. As the famous Copenhagen interpretation of quantum mechanics argues, we cannot speak about an objective reality other than that which is revealed through measurement and observation. As Marin explains, the debate of consciousness in quantum theory began around 1927 when Einstein accused Neils Bohr of introducing a mysticism incompatible with science. Bohr denied the accusation and blamed it on Einstein misunderstanding him when he said that humans are both actors and observers in the world. Yet while Bohr believed that quantum processes occurred without the need for observers, he also sympathized with the idea that an extension of quantum theory might help in understanding consciousness. Einstein, for his part, adamantly opposed any subjectivity in science. He disagreed with Bohr’s view that it is unscientific to inquire whether or not Schrödinger’s cat in a box is alive or dead before an observation is made. Einstein devoted much of his later life to searching for elements of reality to make quantum mechanics a theory based on realism. For instance, the EPR paradox (Einstein-Podolsky-Rosen paradox) thought experiment in 1935 attempted to restore realism and causality to the theory. On the other hand, Wolfgang Pauli truly did harbor some of the views that Einstein accused Bohr of. Pauli favored a hypothesis of “lucid mysticism,” a synthesis between rationality and religion. He speculated that quantum theory could unify the psychological/scientific and philosophical/mystical approaches to consciousness. Pauli’s perspective was influenced by the philosopher Arthur Schopenhauer, whose views on reality were in turn influenced by Eastern religions. In the next few years Werner Heisenberg and Erwin Schrödinger leaned toward the side of mysticism, irritating Einstein and Planck. For others, the choice was not clear cut. Marin argues that the mathematician John Von Neumann intentionally used ambiguous terms when discussing the philosophy of quantum equations, meaning he could fit on either side. “He was a genius at linguistic innovation and came up with German terms that could support many different interpretations,” Marin said. In 1958, Schrödinger, inspired by Schopenhauer from youth, published his lectures Mind and Matter. Here he argued that there is a difference between measuring instruments and human observation: a thermometer’s registration cannot be considered an act of observation, as it contains no meaning in itself. Thus, consciousness is needed to make physical reality meaningful. As Schrödinger concluded, "Some of you, I am sure, will call this mysticism. So with all due acknowledgement to the fact that physical theory is at all times relative, in that it depends on certain basic assumptions, we may, or so I believe, assert that physical theory in its present stage strongly suggests the indestructibility of Mind by Time." As Marin notes, Schrödinger’s lectures mark the last of a generation that lived with the mysticism controversy. As Marin explains, quantum mechanics up to World War II existed in a predominantly German context, and this culture helped to form the mystical zeitgeist of the time. The controversy died in the second half of the century, when the physics culture switched to Anglo-American. Most contemporary physicists are, like Einstein, realists, and do not believe that consciousness has a role in quantum theory. The dominant modern view is that an observation does not cause an atom to exist in the observed position, but that the observer finds the location of that atom. As Marin has shown, the mysticism controversy in quantum mechanics did not involve just a few physicists and mystics (as it seems to today), but at one time it attracted the physics community at large. Some of the ideas have since resurfaced, such as in Eugene Wigner’s 1961 paper on the subject, which inspired popular books such as The Tao of Physics and The Dancing Wu Li Masters, which seek to connect quantum physics to Eastern mysticism for a new generation, along with the recent film What the Bleep Do We Know? Marin hopes that scientists today might gain a new perspective on their research by considering how the founders of quantum mechanics viewed the theory. “Whenever I read scientific articles citing the classic equations conceived by German scientists, it seems to me they could have been improved by researching how the scientists themselves interpreted their own equations,” Marin said. “Among contemporary quantum field theories, the important gauge theories are indebted to the work of [Hermann] Weyl and Pauli. Yet many physicists today would be shocked if they learned how Weyl and Pauli understood the concept ‘field’ when they wrote their classic articles. They were both immersed in mysticism, searching for a way to unify mind and physics. Weyl published a lecture where he concluded by favoring the Christian-mathematical mysticism of Nicholas of Cusa. Moreover, Pauli's published article on Kepler presents him as part of the Western mystical tradition I study. The world's first floating wind turbine is to be towed out to sea this weekend. Statoil's Alexandra Beck Gjorv told the BBC the technology, the Hywind, to be put off Norway's coast - "should help move offshore wind farms out of sight". And it could lead to offshore wind farms eventually being located many miles offshore, away from areas where they cause disruption, Ms Gjorv added. This would benefit military radar operations, the shipping industry, fisheries, bird life and tourism. "Taking wind turbines to sea presents new opportunities," said Ms Gjorv, of Statoil's new energy division. "The wind is stronger and more consistent [and] areas are large." 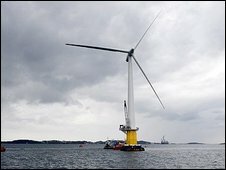 Floating wind farms are set to be connected to mainland grids via cables across the seabed. The longer the cable, the more expensive it is, so the distance from land is not set to become unlimited, explained Ms Gjorv. The Hywind, a 2.3 megawatt (MW) wind turbine built by Siemens, combines technologies from both the wind farming industry and the oil and gas sectors, and will be tested off the coast of Norway for two years. 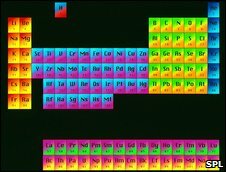 The ubiquitous periodic table will soon have a new addition - the "super-heavy" element 112. 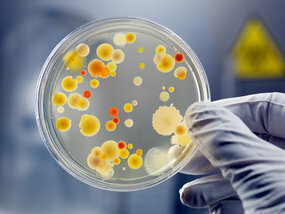 Bacteria may be regarded as simple organisms, but scientists have created a strain that can count to three. The advance by scientists from Boston University and the Massachusetts Institute of Technology could lead to environmental or biological sensors that measure toxins and then self-destruct once their job is done. "We didn't teach the bacteria to count, we programmed them to count," says James Collins, a professor at Boston University and a co-author on the study, which appeared in a recent issue of the journal Science. "We can use this new ability as a read-out mechanism or control switch." Food of the Future to Be More Diverse? The study followed 2,500 people age 70 to 79 for eight years, testing their cognitive skills several times over the years. Many of the participants showed decline in cognitive function. Fifty-three percent of the participants showed normal age-related decline and 16 percent showed major cognitive decline. However, 30 percent of the participants had no change or improved on the tests over the years. The researchers then examined what factors made the people whose cognition stayed sharp different from those who lost some of their abilities over eight years. "To this day, the majority of past research has focused on factors that put people at greater risk to lose their cognitive skills over time, but much less is known about what factors help people maintain their skills," said study author Alexandra Fiocco, PhD, of the University of California, San Francisco. “Ultra” brands of toilet paper such as Charmin, Cotton­­elle and Quilted Northern may feel soft but they’re hard on the environment because they’re made from virgin fiber and bleached with chlorine. Virgin fiber typically comes from trees grown for pulp production or from sawmill leftovers after trees are cut into lumber. The alternative: brands made from 100 percent recycled fiber, preferably with at least 80 percent postconsumer content. Planting a vegetable garden is an inexpensive way to obtain fresh, pesticide-free food that hasn’t traveled hundreds of miles to reach your plate. Sending a kid outside to play can improve his or her concentration and fight climate change. A study published in 2008 by researchers at the University of Illinois found that children with attention-deficit hyperactivity disorder who took walks outdoors raised their attentiveness scores and that kids who walked in natural settings did better than those who walked city streets. A dose of nature was just as effective as a dose of Ritalin. Of course, the more time kids spend playing outdoors the less time they’ll spend at video-game consoles—which consume an estimated 16 billion kilowatt-hours of electricity annually, about four times the output of Hoover Dam. Building or remodeling a house? Consider buying used flooring, doors, indoor and outdoor fixtures, and other salvaged construction materials. You’ll keep these items out of the landfill and reduce your consumption of raw materials. Read the label on your shampoo or skin cream bottle and you’re very likely to find all sorts of mysterious chemicals lurking in the fine print. Is polyquater­nium-10 safe for you and everything that lives downstream from your shower drain? And why do toothpastes and toilet bowl cleaners share some ingredients? Remove all vegetation from your boat and trailer before leaving the boat ramp. Drain water from the motor, bilge and wells before leaving. Dump leftover bait on land, away from the water’s edge. Back home, rinse your boat, motor and trailer; let them dry in the sun for several days before visiting a different body of water. U.S. companies waste almost $4 billion annually on nighttime electricity for computers, according to New Boundary Technologies, a company that says its Green IT Solution software (for Windows computers) can slash computing energy costs by up to 60 percent. After employees go home, the software puts their PCs into hibernation by automatically adjusting power management settings—and overriding any changes the employees may have made during the day. 10.Washing clothes in “hot” water heated to 140 °F uses almost twice as much energy as washing them in “warm” water at 104 °F. Paying bills online not only saves postage, it also makes a serious dent in your consumption of energy and natural resources. According to the “green calculator” devised by the PayItGreen Alliance, the average American household receives 19 bills and statements monthly and makes seven payments in paper form. Switching to electronic billing would save 6.6 pounds of paper, 63 gallons of wastewater discharge, 4.5 gallons of gasoline and 171 pounds of greenhouse gases a year. A study by the alliance, a nonprofit group supported by the banking industry, claims that if just 2 percent of American households switched from paper to electronic billing, more than 180,000 trees would be spared and greenhouse gas emissions would be reduced by the equivalent to taking 32,572 cars off the road. Today, renewable energy sources generate 12 percent of electricity in the U.S. But wind, wave, sunshine and others represent more than 93 percent of the energy the country could be producing, according to the Energy Information Administration of the U.S. Department of Energy. If renewable energy is going to be a bigger player and have a significant impact in cutting the greenhouse gas emissions from power plants that are driving climate change, it's going to have to grow quickly. According to Princeton University scientists Stephen Pacala and Robert Socolow's "wedge" strategy of climate change mitigation—which quantifies as a wedge on a time series graph various sets of efforts to maintain flat global carbon emissions between now and 2055—at least two million megawatts of new renewable energy will have to be built in the next 40 years, effectively replacing completely all existing coal-fired power plants as well as accounting for increases in energy use between now and mid-century. "It's a goal that's beyond anything probably the world's ever undertaken," says Keely Wachs, senior director of corporate communications at BrightSource Energy, a company that hopes to build 2,600 megawatts-worth of power plants that use the sun's heat to generate electricity. Here are 10 massive projects already producing energy. 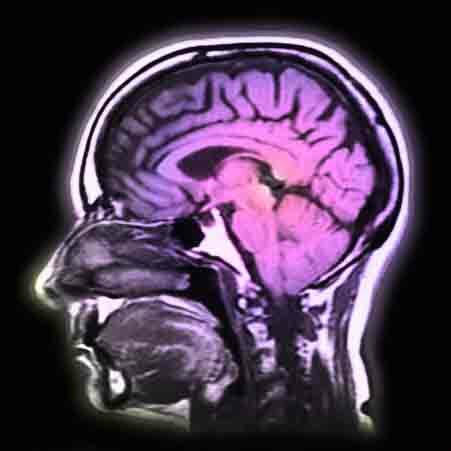 DISCOVER reporter David Ewing Duncan uses fMRI to try to track his thoughts on some big questions. James Brewer takes a seat beside me in a café at the San Diego Convention Center, where we are both attending the largest neuroscience meeting in the world: thirty thousand brains researching brains. With his balding head, bright eyes, and baby cheeks, Brewer, a neurologist at the University of California at San Diego, looks like a large and curious toddler. An unlikely messenger, perhaps, in what for me is now a moment of truth. I had undergone a series of diagnostic procedures in his laboratory, and now, inside the laptop he has placed on the table, are the results of my brain tests. “Your brain is shrinking,” he says. This is the last thing I expected to hear. Not me, a man who considers himself healthy and ageless, at least in his own, er, mind. If similar changes were to happen to the Earth's climate today as a result of global warming – as scientists believe is possible - this might lead to drier tropics, more wildfires and declines in agricultural production in some of the world's most heavily populated regions. Do you know that the Arabian Peninsula used to have green medows with flowing rivers only a few thousand years ago? 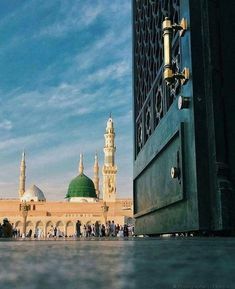 Allah's Messenger ( peace be upon him) as saying: The Last Hour will not come before wealth becomes abundant and overflowing, so much so that a man takes Zakat out of his property and cannot find anyone to accept it from him and till the land of Arabia becomes meadows and rivers. (AP) -- Whether it's around the dinner table or just in front of the TV, U.S. families say they are spending less time together. The decline in family time coincides with a rise in Internet use and the popularity of social networks, though a new study stopped just short of assigning blame. The Annenberg Center for the Digital Future at the University of Southern California is reporting this week that 28 percent of Americans it interviewed last year said they have been spending less time with members of their households. That's nearly triple the 11 percent who said that in 2006. These people did not report spending less time with their friends, however. Michael Gilbert, a senior fellow at the center, said people report spending less time with family members just as social networks like Facebook, Twitter and MySpace are booming, along with the importance people place on them. Five-year-old Facebook's active user base, for example, has surged to more than 200 million active users, up from 100 million last August. Meanwhile, more people say they are worried about how much time kids and teenagers spend online. In 2000, when the center began its annual surveys on Americans and the Internet, only 11 percent of respondents said that family members under 18 were spending too much time online. By 2008, that grew to 28 percent. "Most people think of the Internet and (our) digital future as boundless, and I do too," Gilbert said. But, he added, "it can't be a good thing that families are spending less face-to-face time together. Ultimately it leads to less cohesive and less communicative families." In the first half of the decade, people reported spending an average of 26 hours per month with their families. By 2008, however, that shared time had dropped by more than 30 percent, to about 18 hours. The advent of new technologies has, in some ways, always changed the way family members interact. Cell phones make it easier for parents to keep track of where their children are, while giving kids the kind of privacy they wouldn't have had in the days of landlines. Television has cut into dinner time, and as TV sets became cheaper, they also multiplied, so that kids and parents no longer have to congregate in the living room to watch it. But Gilbert said the Internet is so engrossing, and demands so much more attention than other technologies, that it can disrupt personal boundaries in ways other technologies wouldn't have. "It's not like television, where you can sit around with your family and watch," he said. The Internet, he noted, is mostly one-on-one. Likely because they can afford more Web-connected gadgets, higher-income families reported greater loss of family time than those who make less money. And more women than men said they felt ignored by a family member using the Internet. The center's latest survey was a random poll of 2,030 people ages 12 and up was conducted April 9 to June 30, 2008, and has a margin of sampling error of plus or minus 3 percentage points. Is The Sky The Limit For Wind Power? ScienceDaily (June 16, 2009) — In the future, will wind power tapped by high-flying kites light up New York? A new study by scientists at the Carnegie Institution and California State University identifies New York as a prime location for exploiting high-altitude winds, which globally contain enough energy to meet world demand 100 times over.